Did you know backyard living spaces can get you higher rent? Looking for ideas for your backyard? Look beyond your patio furniture and check out these trends! 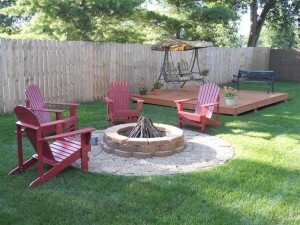 Fire Pit: A central gathering place enjoyed year round, a fire pit is one of the hottest trends in outdoor living. Surrounded by simple patio furniture or lawn chairs, you can buy a fire pit from the store or make your own, either one will be a hit! Flagstone Grass Patio: A simple and easy weekend project, laying flagstone onto a small (or large) area in your back yard provides a great space for patio furniture. 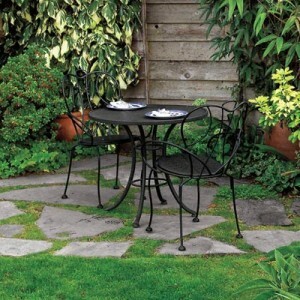 Your new patio will be easy to maintain and blend in with the surrounding landscape. Cinderblock Bench Seating: An affordable alternative to buying patio furniture is creating a comfy bench situated up against a wall or sturdy structure. 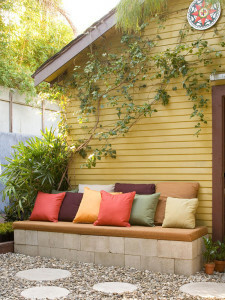 Placing a large cushion and pillows atop your stacked cinderblocks will be a big hit for your outdoor space this summer! 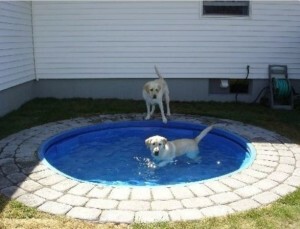 Dog Pool: Keep the pets cool while having a blast! Take the baby pool one step further for your pets by digging a shallow hole just low enough to make the baby pool ground level, then finish it off by adding pavers or blocks. Guaranteed to be a great time for the pets! 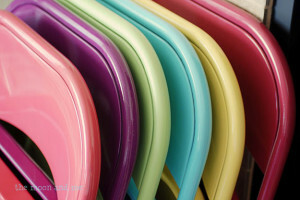 Add Some Color: Found some old beaten up chairs at a local garage sale? Bring them back to life by spray painting them with beautiful summer colors!